جهت شناسایی عوامل قارچی پوسیدگی بنه زعفران و کنترل آن‌ها، از مزارع و محل‌های نگهداری بنه، واقع در بشرویه از توابع استان خراسان جنوبی، نمونه‌برداری صورت گرفت. پس از کشت بافت‌های آلوده، گونه‌های قارچیPenicillium digitatum، Aspergillus nigerو Rhizopus stoloniferجداسازی و شناسایی گردید. جهت کنترل این بیمارگرها از چهار غلظت از سوسپانسیون باکتری Pseudomonas fluorescens CHAO، قارچ Trichoderma harzianum Bi و قارچ‌کش‌های اکسی‌کلرورمس و بنومیل در چهار تکرار استفاده شد. بر اساس میزان قطر پرگنه رشد یافته از بیمارگر و مقایسه با شاهد، میزان اثر کنترلی عوامل کنترل زیستی و ترکیبات شیمیایی اندازه‌گیری شد. نتایج به‌دست‌‌آمده نشان داد که بیشترین میزان کنترل در مورد قارچ همستیز، مربوط به غلظت‌های7 10×1 و 8 10×1 و در مورد باکتری همستیز به ترتیب مربوط به غلظت‌های 9 10×1 و 1010×1 بوده است. در مورد ترکیبات شیمیایی به‌کار رفته بیشترین میزان اثر کنترلی در مورد بنومیل و اکسی‌کلرورمس به‌ترتیب در غلظت‌های3-10×3 و 3-10×4 به‌دست آمد. در مقایسه کلی تیمارها، قارچ T. harzianum بیشترین اثر را در کاهش رشد پرگنه قارچ‌های بیمارگر داشت. In order to isolation and identification of causal agents of corm rot and their control, the sampling was done from corms in farms of Bushroueye, southern Khorasan province. After culturing of sections of infected corms, the fungi, Penicillium digitatum, Aspergillus niger, and Rhizopus stolonifer were isolated and identified. For their control test, four concentrations of Pseudomonas fluorescens CHAO, Trichoderma harzianum Bi, and four concentrations of fungicides, cupper oxichlorore and benomil,were used with four replications. The control effect of antagonists and fungicides were determined by measurement of diameter of pathogens colony on medium. The results showed that the maximum of control of antagonistic fungus were obtained in concentrations of 1×107 and 1×108, and in the case of antagonistic bacterium wereshown in concentrations of 1×109 and 1×1010. The fungicides had maximum control in concentrations of 3×10-3 and 4×10-3. In general, among of the treatments, T. harzianumwas most effective to reducing the growth of pathogenic fungi. 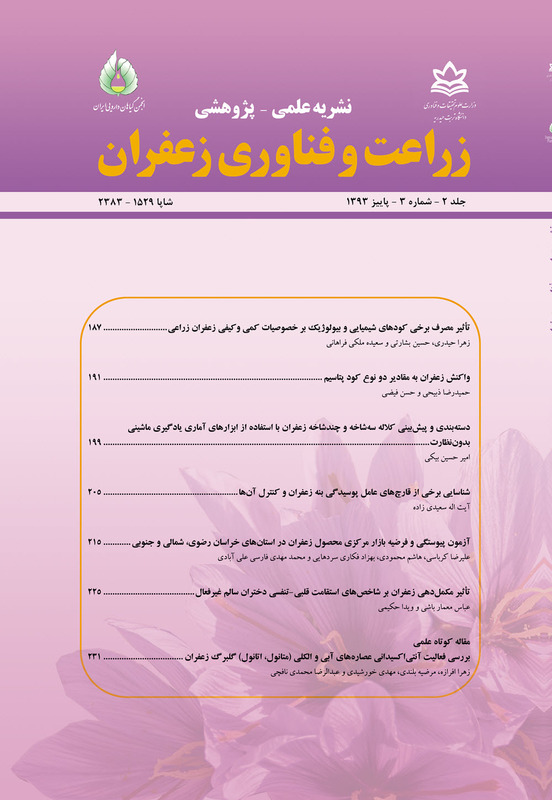 Biocontrol, Antagonist, Saffron, Southern Khorasan. Coursey, D.G., and Booth, R.H. 1972. The post-harvest phytopathology of perishable tropical produce. Review of Plant Pathology 51: 751-765. Dennis, C. 1983. Post-harvest pathology of fruits and vegetables. Academic Press, New York. Pp. 264. Dubos, B. 1984. Biocontrol of Botrytis cinerea on grapevine by antagonistic strain of Trichoderma harzianum. Pages 370-374 in: Current Perspectives in Microbial Ecology. M.J. Klub and C.A. Reedy, eds. American Society for Microbiology, Washington, DC. Dubos, B. Jailloux, F., and Bulit, J. 1982. Employing antagonistic properties of Trichoderma against Botrytis cinerea in the protection of vineyards against grey-mold. Phytoparasitica 10:134. Forakinejad, Z. 2008. Saffron, red gold of Iran. Journal of Teaching Biology 22 (2): 62. Frisvad, J.C., and Samson, R.A. 2004. Polyphasic taxonomy of Penicillium sungenus Penicillium. A guide to identification of food and air-borne terverticillate Penicillia and their mycotoxins. Studies in Mycology 49: 1-173. Hassan, M. G., and Devi, L.S. 2003. Corm rot diseases of saffron in Kashmir valley. Indian Phytopathology 56 (1): 112. Hebbar, K. P., Martel, M. H., and Heulin, T. 1998. Suppression of pre- and postemergence damping-off in corn by Burkholderia cepacia. European Journal of Plant Pathology 104: 29-36. Janisiewicz, W.j. 1987. Biological control of postharvest diseases of pome fruits. (Abstr.). Phytopathology 75: 1301. Janisiewicz, W.J. 1988. Biocontrol of postharvest diseases of apples with antagonist mixtures. Phytopathology 78: 194-198. Kalha, C. S., Gupta, V., Gupta, D., and Priya S. 2007. First report of sclerotial rot of saffron caused by Sclerotium rolfsii in India. Plant Diseases 91 (9): 1203-1203. Kerry, B.R. 1998. Progress towards biological control strategies for plant-parasitic nematodes. The 1998 Brighton Crop Protection Conference: Pests and Diseases 3:739-746. Lim, T.K., and Rohrbach K.G. 1980. Role of Penicillium funicoulosum starins in the development of pineapple fruit diseases. Phtopathology 70: 663-665. Maleki Ziyarati H., Roostaei A., Sahebani N., Etebarian H.R., and Aminian H. 2009. Study on biological control of root-knot nematode Meloidogyne javanica (Trube) Chitwood by fungus Trichoderma harzianum Rifai in tomato at greenhouse and quantitative changes in phenolic compounds in plant. Seed and Agronomy 25 (3): 274- 261. Moazami Goudarzi, M. 2008. Red gold of Iran, from production to process. Journal of Livestock, agro-industry 103: 56. Primo, P., and Cappelli, C. 2000. Preliminary characterization of Fusarium oxysporum f.sp. gladioli causing Fusarium corm rot of saffron in Italy. Plant Diseases 84 (7): 806-806. Pusey, P.L., and Wilson, C.I. 1984. Postharvest biological control of stone fruit brown rot by Bacillius subtilis. Plant Diseases 68: 753-756. Rowe, R.C., Johnson, D.A., Beery, W.R., and Omer, M.A. 2000. Vegetative compatibility analysis of strains of Verticillium dahliae from potato seed tubers and plants from the western and eastern United States Pp 74-94 in: advances in verticillium research and disease management (E. Tjamas, R.C. Row, J.B. Heal and D. Fravel, eds.). The American Phytopathological Society, St. Paul, MN. SAS Institute. 1999. SAS/Stat User’s Guide, Version 8.0. SAS Institute, Cary, NC. Schipper, M.A.A. 1984. A revision of the genus Rhizopus. I. The Rh.stolonifer-group and Rhizopusoryzae. CBS Studies in Mycology 25:1-19. Schnathorst, W.C., and Mathre D.E. 1966. Host rang and differentiation of a severe form of Verticilliumalbo–atrum in cotton. Phytopathology 56: 1155-1161. Shah, A., and Srivastava K.K. 1984. Control of corm rot of saffron. Progressive Horticulture 16(1/2): 141-143. Sud, A.K., Paul, Y.S., and Thakur B.R. 1999. Corm rot of saffron and its management. Journal of Mycology and Plant Pathology 29(3): 380-382. Thakur, R.N., Singh, C., and Kaul B.L. 1992. First report of corm rot in Crocus sativus. Indian Phytopathology 45 (2): 278. Tronsmo, A. 1983. Trichoderma harzianum used as a biocontrol agent against Botrytis cinerea on apple. Colloq. INRA 18: 109-113. Tronsmo, A., and Raa J. 1977. Antagonistic action of Trichoderma pseudokoningii against the apple pathogen Botrytis cinerea. Phytopathologische Zeitschrift-Journal of Phytopathology 89: 216-220. Van Tieghem, P.E.L. 1867. Aspergillus niger. Annual of Science of National Botany 5 (8): 240. Weller, D.M., and Cook R.J. 1983. Suppression of take-all of wheat by seed treatments with fluorescent pseudomonads. Phytopathology 78: 463-469. White, D., Knox, G., Killham, K., and Leifert C. 1999. The application of lux-gene technology in the control of soilborne diseases. 227-248. Wilson, C.L., Franklin, J.D., and Pusey, P.L. 1987. Biological control of Rhizopus rot of peach with Entrobacter cloacae. Phytopathology 77: 303-305. Yuan, K.K., Guang, X.Z., Sheng, C.Q., Chong, H.D., Jun, Z.L., and Zhong, C. 2000. Study on occurrence and chemical control of saffron corm rot in Shanghai suburbs. Acta Agriculturae Shanghai 16: 41-45. Zain, M.E., Razak, A.A., El-Sheikh, H.H., Soliman, H.G., and Khalil, A.M. 2009. Influence of growth medium on diagnostic characters of aspergillus and penicillium species. African Journal of Microbiology Research 3 (5): 280-286.